Why is there Spring Snow in the Great Lakes? The Environment Report, from Mr. Great Lakes (Jeff Kart), for March 22, 2013. Heard at 9 a.m. Fridays in Bay City, Michigan, on Q-90.1 FM, Delta College. 1 – Is climate change leading to more snow in the Great Lakes region? A new paper from University of Michigan researchers examines the question. One part of the answer may be lake-effect snow, according to U of M researchers. 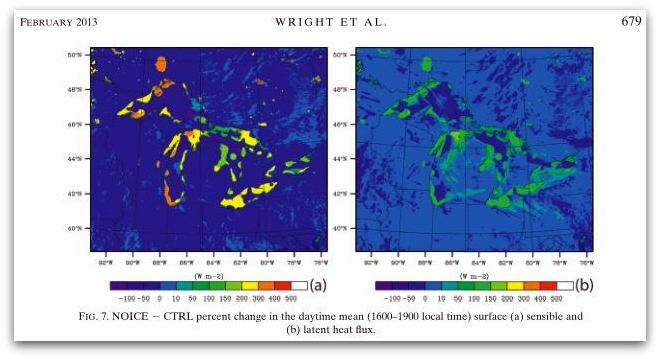 They examined the impact of ice cover and water temperatures on lake-effect snow. They used a high-resolution weather forecast model to see how lake-affect snow would be impacted by: complete ice cover on the Great Lakes, no ice cover, or warmer surface water temperatures. The results? If there’s a reduction in lake ice, or lake ice starts forming later in the winter season, that can help to increase the area along the lakeshore that experiences snow in a lake-effect snow event. And, if the lake surface temperature begins to significantly increase above normal values during the winter season, the overall amount of snowfall increases, along with how far inland the snowfall is seen. And so, areas that normally do not experience lake-effect snow in the Great Lakes could begin to experience more snowfall in the future, the study says. 2 – The status of the Lake Huron fishery is the topic of three upcoming regional workshops to be held along the Saginaw Bay coastline. The educational workshops will offer current research and information for anglers, charter captains, resource professionals, and interested members of the public. The events are being put on by the Michigan Sea Grant and Michigan State University Extension, in partnership with the Michigan Department of Natural Resources Fisheries Division and other organizations. The workshops will include information and status updates on: Low water levels, fish population and angler catch data, the resurgence of native species such as walleye, forage fish surveys, results from the Lake Huron predator diet study, and other topics. Pre-registration is requested. Evening fishery workshops are planned for April 18 in Ubly, April 24 in Oscoda, and April 25 in Cedarville. 3 – It’s spring, and Earth Day is just around the corner. The Saginaw Bay Watershed Initiative Network, also known as Saginaw Bay WIN, is holding another Earth Day Grant Contest this year. To enter the contest, the organization must describe their project in 50 words or less and send it to Saginaw Bay WIN. Entries will be posted to Saginaw Bay WIN’s website and Facebook page. The project that receives the most votes online will take home a $1,000 grant to implement their idea. The deadline for entries is April 5, and voting begins April 10.